Creative Halo is a Bluetooth speaker with integrated light-show | What Hi-Fi? The Bluetooth 4.2 wireless speaker has an eight hour battery life, built-in speakerphone and 12 light patterns you can remotely control. Who doesn't love a good rainbow? The Ancient Greeks thought they were the path of a messenger deity Iris; In Norse Mythology - and the recent Marvel films - a rainbow called the Bifröst bridges the gap between gods and humans. Aborigines in Australia thought the rainbow was a giant (or, normal-sized - the myth differs depending on who's telling it) snake that governs the water. 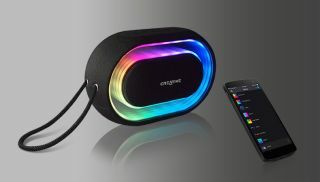 And now, you can get your own mini-rainbow in a Bluetooth speaker, courtesty of Creative. The Creative Halo speaker has a front panel that puts on a multicoloured halo-effect light show, with 12 patterns that can be activated by pushing a button on the speaker or through Creative's Xpectra app. It can be turned off, though, if you want to use the speaker at night. On the sonic side, there are two full-range drivers mounted in a reflex chamber, supported by a passive woofer for the bass. The Halo also has integrated speakerphone, a 3.5mm jack for non-Bluetooth devices, and battery life of up to eight hours. It's available from September, priced at £60, and looks perfect for playing the What Hi-Fi? Playlist. Save over 50% on What Hi-Fi? plus a free five-star wireless speaker!